Okay so here’s the thing about red velvet… I don’t get it. I used to work at a cupcake shop for a while, and our red velvet cupcakes were probably the best selling item on the menu. People went nuts for those cupcakes. Every day just as many red velvet cupcakes were baked as were all the other flavors combined, and on most days the red velvets were sold out before anything else. I thought most of the cupcakes there were phenomenal, but the red velvet was probably my least favorite. It was kind of bland, with no distinct flavor beside the cream cheese icing swirled on top. Not enough vanilla to be vanilla cake, so little cocoa flavor that I’m not convinced any was actually used. There were plenty of tastier and more interesting flavors to choose from, and I could never figure out why people always went for the red velvets. Are people really just into red velvet because it’s red? There has to be more to it than just the color right? Curiosity got the best of me and I started doing some digging on the internet. It turns out that the history of red velvet, the roots of it’s popularity and the original recipe, are pretty tough to nail down. There are almost as many stories about the origins of red velvet as there are recipes for “real” red velvet. “Real” red velvet means very different things to different people. I’d always heard that red velvet cake originally turned “red” because of a chemical reaction between acid in buttermilk or vinegar and natural cocoa powder. 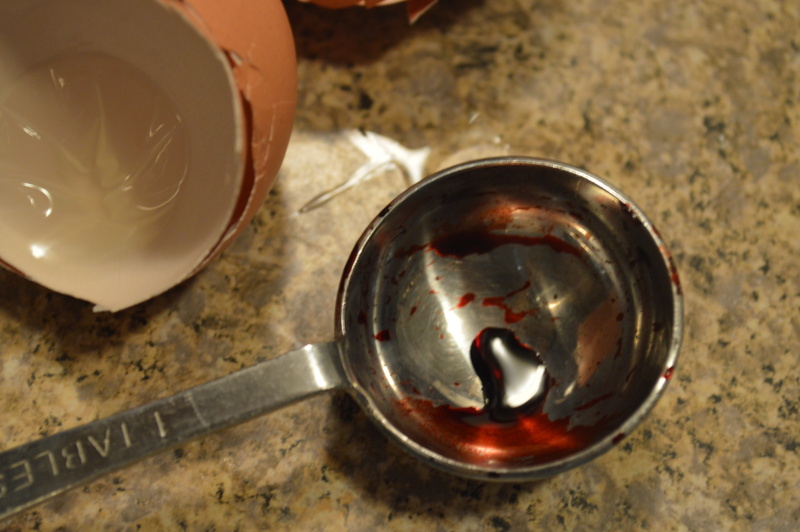 This wouldn’t actually turn a cake RED, but it would, supposedly, produce a very slight reddish hue in a cocoa cake. The same is supposed to be true of the origins of devil’s food cake, but with a lot more cocoa. This sounded believable-ish to me, so in my mind the real “original” red velvet cake was supposed to be deep reddish brown, with a slight cocoa flavor, and of course, topped with cream cheese icing. Once I started digging though, I started running into some problems. First there were the various origin stories. Some people think the cake was invented in Canada by the wife of a wealthy department store president, others convinced that this quintessential southern cake was invented in the south, and others still are certain that it was invented at the Waldorf Astoria Hotel in New York City. Then there were the recipes. 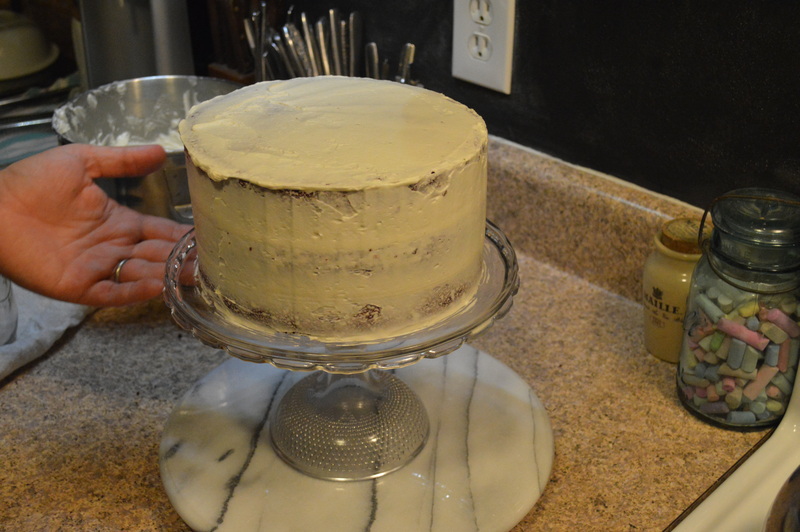 Everyone believes that their red velvet recipe is the one true way it should be done. Google “real red velvet” and you’re going to come up with some wildly varied recipes. There are also a lot of “rules” about red velvet out there, many of them conflicting with the rules of the next guy. Most of the rules dictate something about the color, flavor, or icing of this iconic cake. 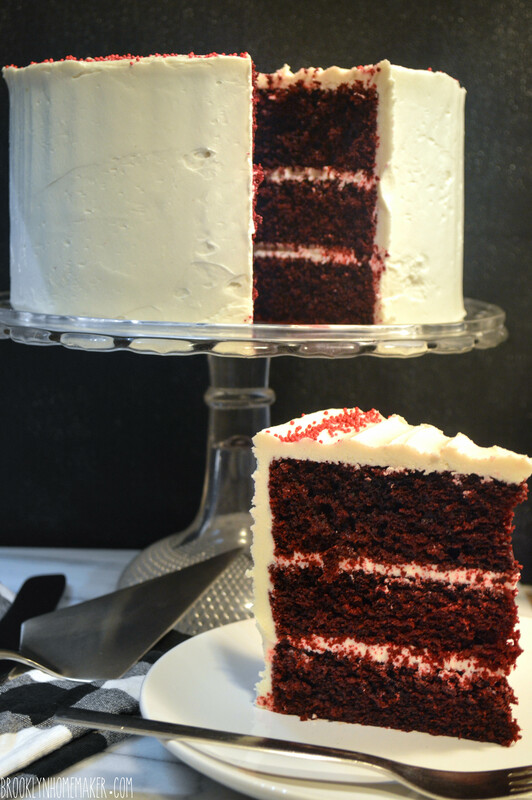 According to the internets, the color of red velvet should always come from artificial color. If you don’t pour in the red food color, it’s not red velvet. Also, red velvet cake should never contain artificial color. If you’re using red food color, you’re doing it wrong. The color should come from cocoa powder and buttermilk, or vinegar, or both. 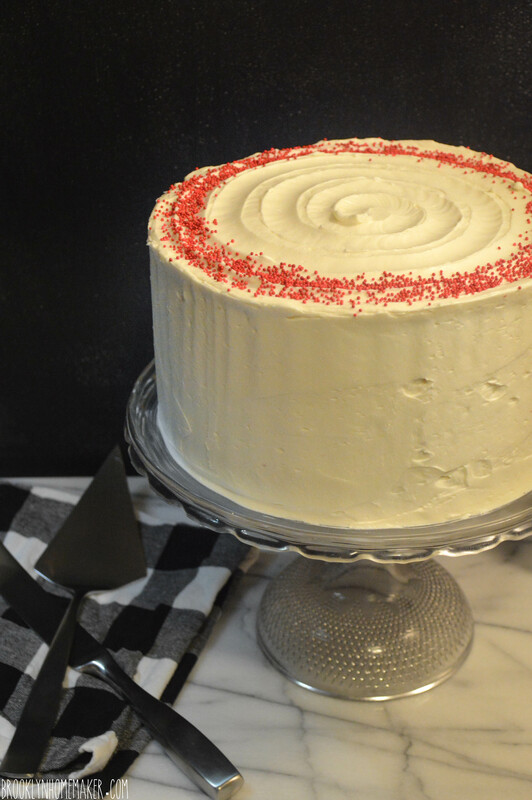 The truth is that the red in red velvet cake needs a boost, but not from food color. 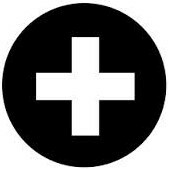 Along with the cocoa and acid reaction, an additional boost of red should come from red wine. Actually it should come from beet juice. Red velvet cake should have a very specific flavor profile that should not be messed with. It seems that red velvet cake is supposed to be a mildly chocolatey cocoa cake, since the red color comes mostly from natural cocoa’s reaction with acidic ingredients. Also, red velvet cake should have only a very slight, almost indistinguishable, cocoa flavor, since the color of this cake should be the star and too much cocoa would muddy the color. At the same time, recipes for red velvet cake should never contain any cocoa powder. Red velvet cake is a bright red buttermilk cake and cocoa would ruin both the color and flavor of this beloved cake. The one thing I thought everyone agreed on was the icing. 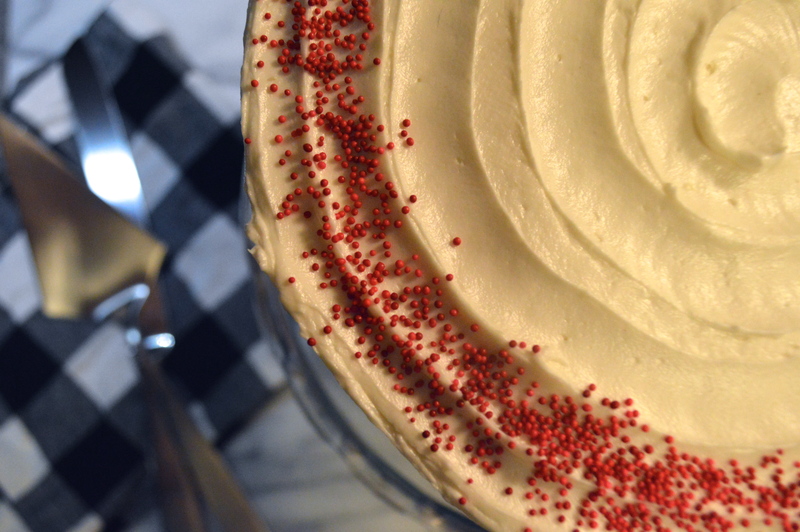 Everyone knows that red velvet cake calls for tangy cream cheese icing, always. Well, yeah. It turns out that some people think that the OG icing for red velvet was ermine icing, also known as butter roux icing, or boiled milk icing. Once I started weeding through the conflicting stories and varied rules and recipes, I started to uncover some facts. It seems that the name most likely evolved as the public’s tastes in sweets were changing at the turn of the last century. At first the name was mostly symbolic and never really had anything to do with the color of the cake. In the late 1800s what we know as brown sugar used to be commonly known as red sugar. Any cake that used finely ground cake flour and had a fine crumb was referred to as a “Velvet” cake. So, at that time any cake with “red sugar” and fine cake flour could be referred to as a red velvet, but no one was really going crazy for red velvet yet, and there is little evidence of any printed recipes for anything like what we have today. At that time natural cocoa was the most commonly available cocoa on the market. Unlike today’s more common dutch process cocoa, the PH of natural cocoa does cause a chemical reaction with acid causing a very slight reddish hue. Devil’s food cake made with natural cocoa would have a slight reddish hue to the deep dark chocolate cake, and that is most likely the origin of that name. 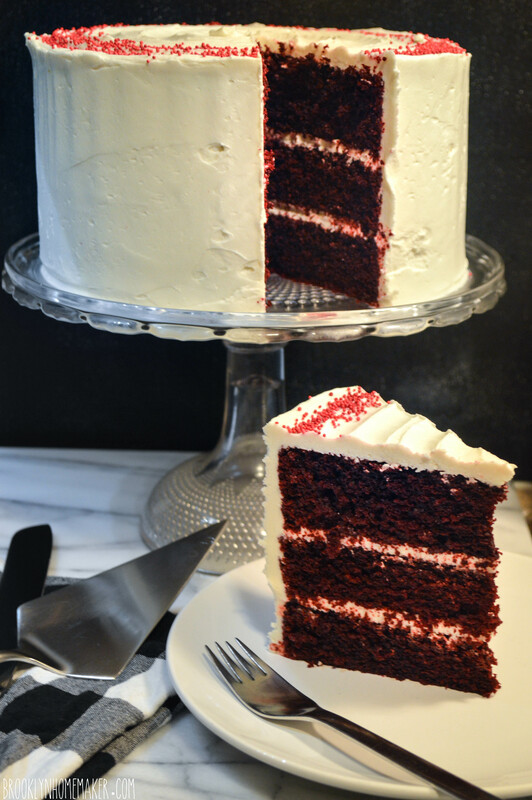 Red velvet cake is devil’s food’s less chocolatey cousin, but again, the cake was never really RED. At the time, these cocoa cakes were often referred to as “mahogany cakes”. It wasn’t until the depression that red velvet cake turned truly red. Food additive and extract companies were struggling at the time because most Americans were cutting back on such luxury items. As a way to boost sales, the Adams Extract Company started marketing their food coloring and flavorings by giving out recipes for a truly red red velvet cake, complete with color photo, in grocery stores. That was when red velvet started taking off, especially in the south. The popularity waxed and waned for generations, and then there was the groom’s cake in Steel Magnolias. Boom. Everyone knew and wanted red velvet. And then a decade or so later, the cupcakes shops started popping up and pushing the red velvet on us. I’m no historian, and I don’t claim to know that any of what I’ve read is the absolute truth, but this seems like the most likely story. Unfortunately I haven’t been able to dig up the depression era recipe that made red velvet the popular cake that it is today. So, the “real” recipe still seems to be something of a mystery, but based on the history I think that natural cocoa is as important to the recipe as the red food color. 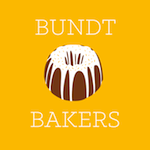 Another point of contention is the icing. I’d always heard, and believed, that cream cheese was king when it came to red velvet cakes, and I was shocked to find out that this wasn’t always so. 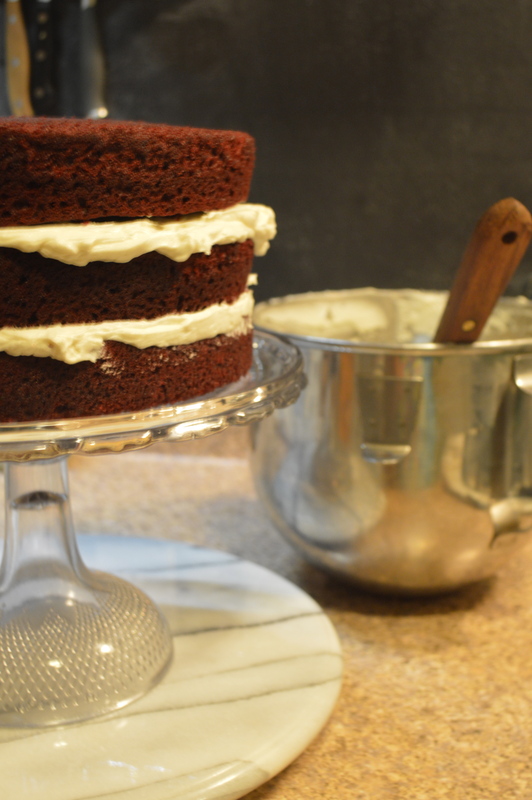 Cream cheese icing wasn’t really common with red velvet until the mid-twentieth century. Before that the traditional topping for red velvet was a creamy and light icing made by cooking milk and flour together, and whipping into creamed sugar and butter. It can be called Butter Roux frosting or Ermine frosting. In the south this icing was very popular because it’s whipped texture is similar to whipped cream, but it’s much more heat stable and keeps better. When I set out to bake my first red velvet cake, I knew I had plenty of recipes to choose from but had to decide which one would produce the cake that I wanted to end up with. I kept going back to natural cocoa and buttermilk but decided that adding red color was just fine with me. 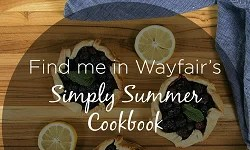 So, I checked in with my favorite food blog, Smitten Kitchen, and guess what, she had a recipe that sounded like exactly what I was looking for. I also decided I wanted to ditch the cream cheese icing and go back to the traditional ermine icing. This recipe calls for a LOT of red food color. At first I thought it might be a typo. It’s not. Since there is more cocoa in this recipe than most, a lot of food color is needed to bring the red forward over the brown. Well. This cake is red alright. 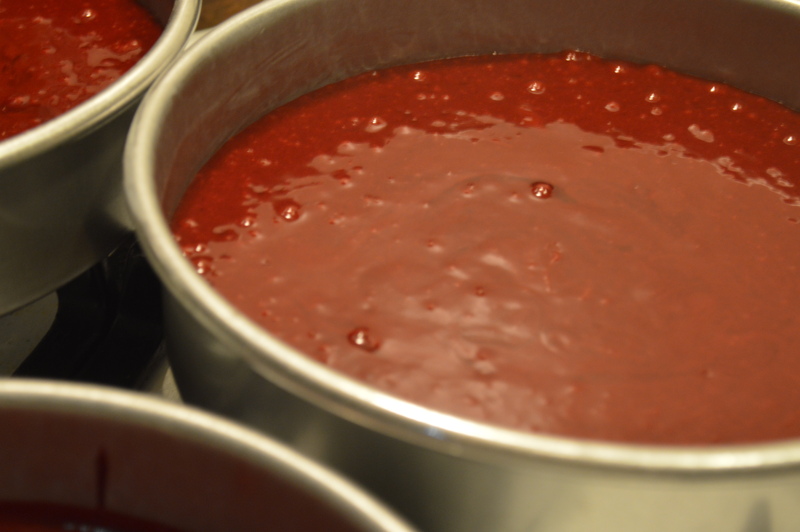 The batter before baking is literally beet red. 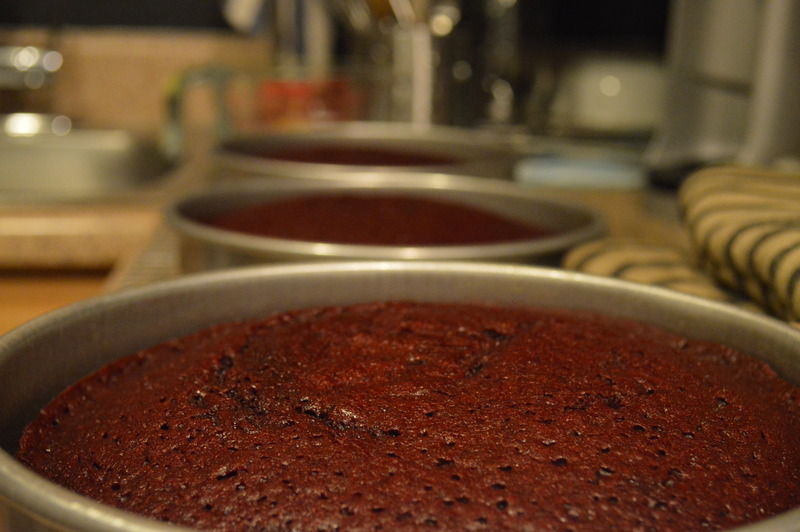 It gets a bit darker in the oven, but even still, the finished cake is a deep dark RED. Pretty much the color you’d see if you sliced into an armadillo. Just sayin’. As a former red velvet naysayer, I have to admit that this cake is pretty amazing. The texture is perfect, super moist, with a very delicate light & fluffy crumb from the cake flour. You can definitely taste the cocoa, even though it doesn’t really scream chocolate. It also has a really pleasant delicate tang from the buttermilk and vinegar, which I think would be completely lost if I’d gone with the modern traditional cream cheese icing instead of the ermine. I totally love this icing, btw. It’s much easier to make than a meringue buttercream, but has a very similar stability, mouth feel and texture. It is easy to work with, frosts smoothly and tastes whipped, creamy, light and just sweet enough. To be perfectly honest, if I’m going to make a cocoa cake I’d like even more chocolate flavor, and even though it’s kind of fun, the amount of food color that goes into this recipe makes me ever-so-slightly uncomfortable. If I’m baking a cake for me, I think I’d rather go for a devil’s food cake, which I think would be delicious (and beautiful) with this same icing. But for special occasions, or for people who love red velvet, this cake is a force to be reckoned with. Perfectly moist & fluffy, with just enough cocoa and buttermilk, and red red RED! Preheat oven to 350 degrees. Place teaspoon of butter in each of 3 round 8-inch layer cake pans and place pans in oven for a few minutes until butter melts. Remove pans from oven, brush interior bottom and sides of each with butter and line bottoms with parchment. Whisk cake flour, cocoa and salt in a bowl. Place oil and sugar in bowl of an electric mixer and beat at medium speed until well-blended. Beat in eggs one at a time. With machine on low, very slowly add red food coloring, being careful it doesn’t splash. Add vanilla. Add flour mixture alternately with buttermilk in two batches. Scrape down bowl and beat just long enough to combine. Place baking soda in a small dish, stir in vinegar and add to batter with machine running. Beat for 10 seconds. Divide batter among pans, place in oven and bake until a cake tester comes out clean, 40 to 45 minutes. Let cool in pans 20 minutes. Then remove from pans, flip layers over and peel off parchment. Cool completely, and level layers with a cake leveler or sharp bread knife. Fill and crumb coat with ermine icing, and place in refrigerator for 30 minutes or more. Then ice and decorate as desired with remaining icing. In a small saucepan, whisk flour into milk and heat, stirring constantly, until it thickens. You want it to be very thick, almost like brownie batter. Remove from heat and let it cool to room temperature. It must be completely cool before you use it in the next step. Stir in vanilla.